I've never been the techie type. So when Supremo sent me to try their latest action camera, I was both excited and worried because it's been a long time since I used one like it. I really felt challenged given the many features that I needed to learn from scratch. But I soon got the hang of it, and I could say that it’s an entry-level camera that you can definitely use on your travels. It’s both hardwearing and affordable. Plus, it has an attractive black matte coating that I absolutely love. Supremo's slick packaging includes a Supremo 4K Camera, Supremo Wrist Remote, Waterproof Case, Replacement Backdoor, Frame, Quick Release Buckle, J-Hook Buckle, 360 Rotating Swivel Arm, 3-Way Pivot Arm + Thumb Screws, Lock Bolt, Flat Mount, Curved Mount, Clip Mount, Handle Bar Mount, Safety Tether, Straps, 3M Adhesives, Rechargeable Batteries, Wall Charger and USB Cable. Supremo4K Accessories from Budget Biyahera on Vimeo. 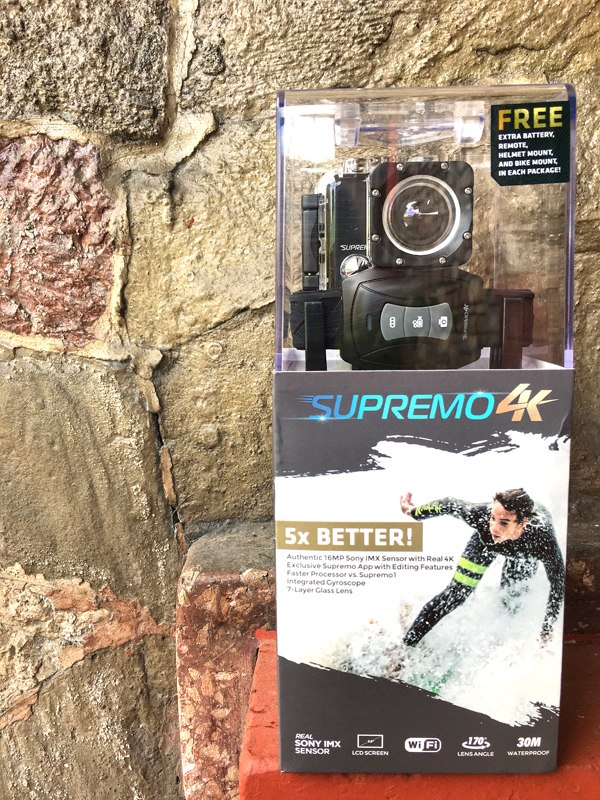 SUPREMO4K Action Camera: How to take a Video or Photo from Budget Biyahera on Vimeo. · The Supremo camera has a wide coverage, even without using the Fisheye feature. But if you'd like to change your Field of View from Wide to Medium or Narrow, you can adjust this on the Setup Menu. · The Wi-Fi feature not only provides convenient transfers of both photos and videos straight to my phone, it also captures real-time snapshots using an App that's free and downloadable from the App Store or Google Play. TIP: The best and most efficient app to use for Supremo 4K is Excam. I had to look for an alternative, as Supremo's own mobile app consistently crashes or hangs. · It has a good battery life, especially if you're just taking photos. I did, however, notice that the battery drains rather quickly when I use it to capture videos, particularly when using either Time Lapse or Slow Motion. · The action camera comes with a lot of accessories, particularly useful and ideal for all adventure junkies. Though I’ve yet to still figure out each ones exact functions. · The audio on the video is pretty audible, especially when you take the camera out of the glass casing. · It has a slick-looking, sturdy glass case, which can be opened and closed easily. · The Supremo package doesn’t include a Memory Card. You'll have to buy it separately. · It best captures videos and photos during daylight, even when using just the default settings (+0.0 Exposure, Auto White Balance and ISO). Though the texture of the photographs wouldn’t look as crisp, despite choosing the Picture Quality to Super Fine, and the Sharpness to Strong. Oftentimes, the images would also look reddish or bluish. 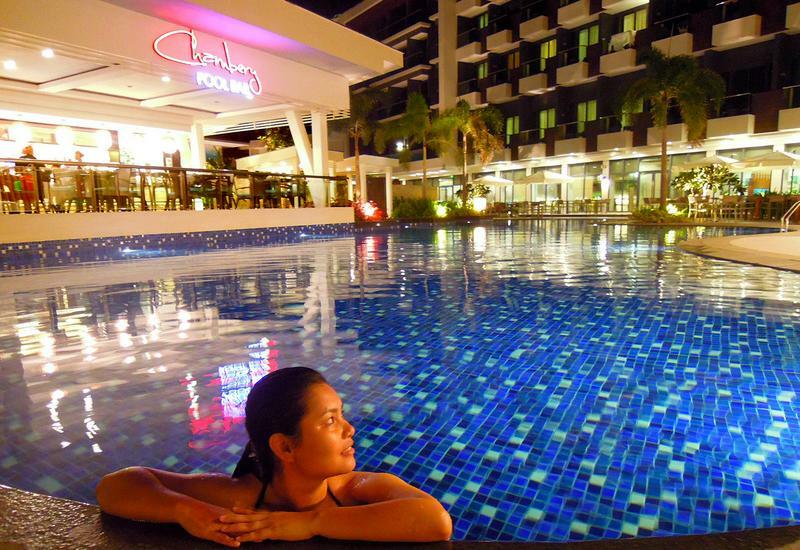 · The images are slightly hazy and pixelated, so I would always enhance my pictures using Snapseed or Photoshop, especially when I want to brighten or sharpen the photos. I kept using the 4K UHD resolution, thinking that it would create the best shots. But the outcome would still look off. So I tried shooting with just the HDR and 720p 60fps options, and somehow had better results. Pro Tip : Now level up your photography skills with the power of cloud by getting an instant remote access to your essential photo editing applications such as Adobe Photoshop etc. on any device(PC/android/iOS) with trending citrix vdi from CloudDesktopOnline. Learn more about Hosted SharePoint, Exchange and QuickBooks Cloud Hosting by visiting Apps4Rent. · The videos that we were able to take at nighttime would always look dark, and would only capture bright lights and silhouettes. I wish there was a way to adjust the settings. If you know how to, care to teach me? Sheikh Zayed Grand Mosque, Abu Dhabi, UAE from Budget Biyahera on Vimeo. · It was a bit of a challenge to use the camera the first time, especially when taking actual photos and videos. Supremo required a certain number of clicks for the buttons to function (i.e. three clicks to change from video mode to photo), which was difficult to grasp in the beginning. · The zoom feature is fixed. It can no longer be adjusted. · Other than the basic how-tos, the Supremo Manual could’ve been a better guide if it was more detailed. For example, I had a hard time using the Time Lapse and Slow Motion features because I didn’t know how to operate either. There weren’t any tutorials online. But I’ve managed to find a group that explained how it was done on the action camera. So I eventually got the flow of things (i.e. go to Settings, choose Time Lapse, set to 2 seconds, go back to screen and let the camera record for 15-20 minutes, then click the OK button once you're done shooting). Time Lapse using Supremo4K Action Camera from Budget Biyahera on Vimeo. I've yet to study this gadget further. Yet I can say that the Supremo 4K is already competitive in terms of price and packaging. It could still use some improvement, especially when it comes to the quality of the photos and/or videos captured. But all in all, this entry-level device is a good option if you’re looking for an action camera that you can use for any given activity. Hello, I have a question po., pag nag rerecord po ako ng video zoom in ko po tpos diko napo ma zoom out. un po ba ung sinasabe niong fixed na ung zoom nya pag nag rerecord tpos dimu na pwede ma zoom out.. Thank's po sa sagot. Hi po, concerning the zoom, zoom in with the ok button, zoom out with the wifi button. but i can only do these while taking pictures and not while taking videos but i'm still learning. So far my Supremo 4k is good considering i'm a newbie. My only complaint is that I can only pair with my android if it(Supremo) is the only wifi around. Hi, I have an issue with the photo that I have with Supremo 4K. Its kinda grainy pag zoomed in. Is it because sobrang taas ng quality na nakaset? Or may need ako iadjust sa settings? Hello. 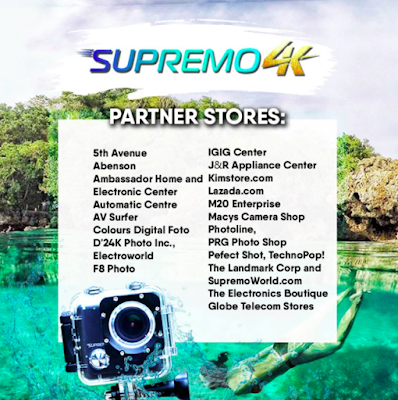 Paano po kayo nag-download ng videos from Supremo 4k? Hindi ko kasi ma-download yung videos ko using Supremo World App. Nag-crash lagi yung app pag videos na. Thank you! Well, that's how it usually works. You can only connect to one wifi connection at a time. The same process goes for other wifi-enabled cameras. Hi ask ko lng po if ganu po katagal ung charging? Hi! I forgot the exact timings. Siguro 1-2 hours? I haven't charged my Supremo for awhile now, so I forgot na.